I've received a number of complaints of Firefox being excessively slow. I'll look at one possible solution. I've received several reports - or rather complaints - of excessive slow downs in recent versions of Firefox. I don't have a cause, but my assistant may have stumbled onto a solution. A simple solution that uses a tool that I've discussed here before: CCleaner. For a long time, Firefox was acting extremely sluggish. Not responding often popped up or I'd be typing and it would freeze for a while. Other times, it would not register a few characters that I typed and then go on with the rest. I tried all the standard stuff: I cleared my browser cache, disabled all my add-ons, trimmed down my favorites. Nothing worked. I even thought of asking Leo. My God, has it come to that? Had he asked me (no, he didn't ), I wouldn't have been much help. Firefox for me has been a fine and speedy browser. But Mark wasn't alone. We often get questions that boil down to the same thing: a very slow Firefox. So today, I tried something different. I ran CCleaner and this time, I cleaned nearly everything except filled form info, site preferences, and cookies. As a result, Firefox runs as snappy as Chrome for me now. I'm not sure which information was slowing me down: maybe a combination of a couple things, but I suspect that it might have been the browsing history as there was so much stuff in it. So, let me walk you through what Mark did. Download and install CCleaner, if you haven't already and run it. Click the Applications tab and Firefox should be near the top. Make sure that the items shown above are checked: the Cache, Internet History, Download History, Session, and Compact Databases. You can also select Saved Passwords as I have here (I use LastPass for that function). 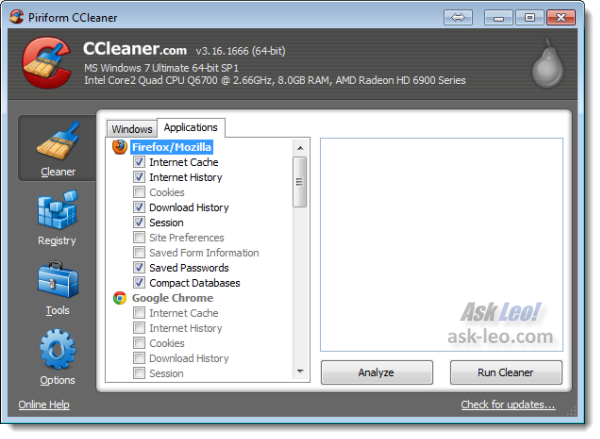 Select any other CCleaner cleaning options that you might like for other applications in the Applications tab and anything that you might like in the Windows tab. Or, alternately, disable everything else so CCleaner only works on Firefox. You'll need to close Firefox if it's running and also Thunderbird because they share some underlying technology. Click Analyze to see what CCleaner would clean, if you're interested. Click Run Cleaner to actually have CCleaner do its work. With luck, you'll now have a snappy Firefox as well. The advice that I typically give people is to check your add-ons. More correctly, disable add-ons to Firefox to see if that makes a difference. Often it does, as it's one of the add-ons that is actually at the root of the problem. When it does, you can then try selectively re-enabling add-ons to see which one is at fault. How do I get rid of IE9's "Speed up browsing by disabling add-ons" notification? IE9 will notify you if it thinks you can speed up browsing because add-ons are taking too long to load. We can change the definition of "too long." I found that the slowness is due to McAfee antivirus real time scan. I turned it off and everything returned to expected speed. It very greatly slowed down Microsoft Live Mail. If you are using McAfee antivirus it is the culprit. I totally concur. FireFox is very fast. At the slightest sign of a slow down, I use CCleaner and one other utility, Auslogics Disk Defrag. Both are free, very fast, and FF revives wonderfully. Remember if you are using and experiencing problems with SeaMonkey you might want to follow these steps too. SeaMonkey is built on Mozilla technology. That sounds pretty dangerous. You are now open to virus attacks. I have used CCleaner for several years and am convinced that is a very useful tool. I run XP Pro and use a variety of programmes, especially photo editing, with Sea Monkey as the browser and my computer still snaps like it did in Aug 2006 when I bought it. Also, when I uninstall a programme I clean the registry with CCleaner, there are always files left after the uninstall. Great tip. Firefox always ran speedily for me up to version 10.0 (I'm now running version 11.0.). This seems to have fixed the problem. I don't use Foxfire but I've used CCleaner for years. I recommened it highly. I've NEVER had any issues with it. I run CCleaner every Sunday morning, I've been doing it for several years as part of a weekly routine. In the past couple of days, after updating to Firefox v11, I was having some problem with Firefox. Excruciatingly slow! My fix was to disable the addon and/or plugin for McAfee SiteAdvisor. Now my copy of Firefox is running very good. You may want to check any/all addons/plugins to see if just maybe they are possibly causing the slow-down. I was having that problem too and a whole bunch of others but I'm not blaming Firefox or Microsoft this time just my lack of knowledge. After a few hours of pulling my hair out I installed Linux Mageia and everything works perfectly. I'm not saying that Linux is the magic bullet for everybody because it isn't. I was just having one of those days. If I would have checked here first I would have found the fixes for my problems. Darn it ! I have CCleaner already installed, but never used it. I am a learner with these things,. ..how can I control what it get's rid of? What if it gets rid of stuff i want to keep? I'm a hoarder, (I know, I shouldn't be). I'm not sure what to tell you beyond the instructions in the article. CCleaner lets you control what is and is not deleted, so make sure that everything else is not selected. Firefox is amazing for its adaptability-- for instance, I routinely run on 18Mbps broadband with 2gb of RAM on an aging AMD Athlon XP 2400+, and Firefox is completely happy. That's not all-- Firefox almost always runs with over 150 open tabs without a significant hit in performance by using a Firefox developer utility called Tree-Style Tabs (https://addons.mozilla.org/en-US/firefox/addon/tree-style-tab/). This keeps Firefox from running out of oxygen as it loads, and loads, and keeps loading additional tabs. There is a limit, of course, and I have crashed into it around 220 open tabs. Barring that extreme, Firefox does not seem to mind as long as I stay around 150 open tabs. To monitor the situation, I use Mark Russinovitch's Process Explorer 12.04, and watch the amount of memory required. Since I do research, my primary purpose is not neck-snapping speed, but an eye-opening number of connections. Firefox lets me handle this working load with aplomb. BTW-- all the many tabs are in a vertical stack on the left end of the screen. This gives me all the headroom I need, and the left tab stack never intrudes on the typically wide, LCD screen. Some time ago, when a new version of Firefox seemed much slower than its predecessor, I discovered check boxes, under Security, the text of which said "Block reported attack sites" and "Block reported web forgeries". I discovered that, whatever innocuous sites you visit, it seemed to take a long time to check. At any rate, when I turned them off things seemed to speed up appreciably. I don't understand why this would be, because there are ways of searching even large numbers of items quite quickly. Things may have changed, but it seemed significant at the time. I'm all for CCleaner, by the way, but you can get Firefox to clean up when it exits. It's years since I allowed it to keep any new cookies at the end of a session. Leo, you almost have it right. The problem with FFox is solved by shutting it down and restarting, not by running CCleaner. Run the windows task manager and watch the memory use as you close and reopen FFox. The CCleaner "fix" seems to work because you must close the browser when you run it. I have to do this many times during the day. It drives me nuts. My work machine has developed a problem with Firefox. Either it doesn't respond to mouse clicks and freezes the mouse cursor, or the page never loads. Sometimes both. I have to quit the program using the task manager. This freeze happens on 20% of the pages I visit, making the program useless to me. I've deleted the cache, removed add-ons, run CCleaner, etc. to no avail. I did notice that when I ask Firefox to check for updated plugins, it reports that Adobe Flash is not up to date. However, I can download and install the latest version successfully, but Firefox STILL reports that Flash is not up to date. I finally downloaded and installed Chrome instead. It works great. I'd like to uninstall Firefox, but I don't know if I dare , because I use Thunderbird for my email, and they came bundled together. Anyone know if this is possible? I too have a problem with the most recent releases of Firefox often failing to load pages when clicking on links, it just hangs on loading. 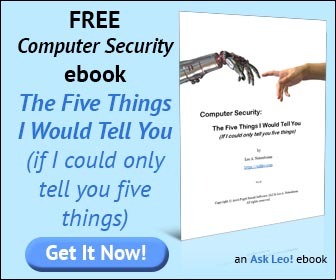 But if I then shut down Firefox & re-try the link it loads immediately. This still happens with all add-ons disabled & the regular use of CCleaner. Check out SpeedyFox, a free utility that has proven to speed up at least the initial load time of FF. Nothing seemed to solve this problem for me CC Cleaner, Ashampoo Cleaner, ad nauseum), so I uninstalled (for the third and last time over a period of a number of years) Firefox and returned to IE. I will probably not try Firefox again. Dave is correct. FF has a memory leak. If you don't close it periodically, it just keeps using more and more resources. When I first open it, it's using about 300K of mem. I generally close it when it gets up around 800K. You can safely uninstall Firefox and still use Thunderbird. They don't depend upon each other. "The CCleaner "fix" seems to work because you must close the browser when you run it." You can configure FFox browser to clear any or all stored data upon closing [or at that particular moment] and avoid using CCleaner for this purpose. Go to Tools=Options=Privacy and review options [and custom options]. While I've never experienced any of the lag/slowness that others are experiencing, it seems using CCleaner requires extra steps/extra time to achieve the same results [blowing FFox's nose to clear it out]. I edit images, and this uses memory quickly. To prevent slow-downs in Firefox, you can limit the cache. In options, click 'advanced', then click the 'network' tab. I limit my cache to 615MB, and I don't get the problem anymore. That's with 4GB of RAM. If your memory block is smaller, or if you have an older processor, you'll need a bit smaller than that. Set it where you want it, then try making it larger, by increments, until you start to notice lag. Then back it down just a bit. It compacts the database just as Ccleaner does. I have the same problem as Jim--slow or no response on specific websites. I suspected it was Flash related when I noticed it seemed to be a problem only on sites with dynamic or animated content. Strangely, if I hit "Back," the site usually loads fine. Not so, if I hit "Refresh" though. I might have to refresh 3x before it will finally load. Anyone know how to fix the problem? I've searched the FF support forums, but I can't find my specific issue among all the other possible bugs/fixes. And, I'm not ready to jump to Chrome yet.